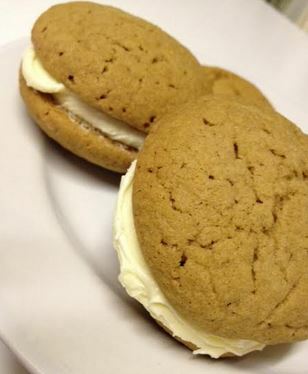 These beauties swing both ways – awesome on their own and amazing with this solid buttercream filling. My husband always offers to help me bake when I make them whereas usually he just disappears from the kitchen and retreats to his office. I suppose that must mean he likes them. 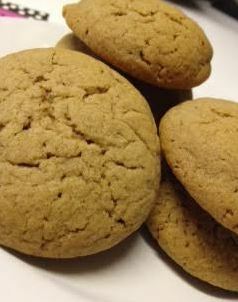 These are great as espresso cookies on their own or add buttercream to make them coffee kisses. We tried coffee in the buttercream and it was a bit too much. Preheat the oven to 170°C unless you have a fan oven like me 160°C. Sift the flour and sugar together in a mixing bowl. Add the butter cubes and rub into the flour mixture until the mixture looks like fine crumbs. Dissolve the coffee in 1 teaspoon of boiling water and set aside to cool slightly. Beat the egg until frothy then add the cooled coffee into the egg and beat more. 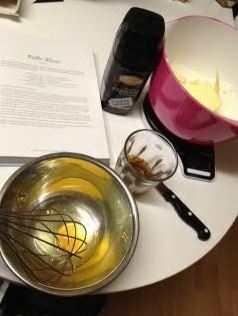 Add the egg and espresso mix to the bowl and stir into the mixture until it comes together in a wet ball of dough. Divide the dough into 16 25g balls and arrange them onto 2 baking trays well apart as they will spread and flatten. Bake for 12 – 15minutes. As these are already brown, look for the tell-tale darker browning around the edge to see that they are done. While the espresso cookies are cooling, to turn them into kisses whip the softened butter then mix in carefully the icing sugar and vanilla extract before adding the cocoa powder. Now ice one of the bottoms of one of the cookies generously and stick a second cookie to that one – instant kisses! I always like a sandwich cookie and coffee ones always seem more sophisticated. Great for passing round after dinner!